In the year 1852, a store and post office was started in the northeast part of Superior township. The store was managed by Allen Coy and he also acted as first postmaster. The place had been known as Coytown. A small community of people lived in the vicinity of this store, but the place never grew and gradually sank into nothing. In 1853, a store was opened by E.W. Tenney, two and one-half miles south of Coy’s store, and a post office was also established there. 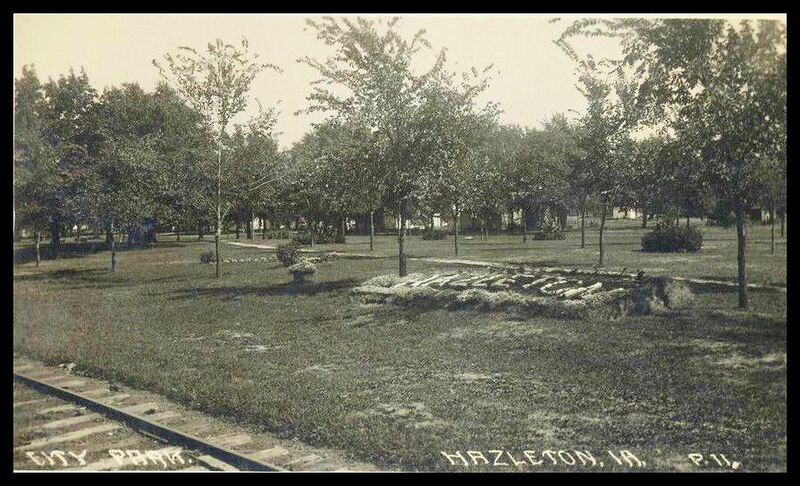 The town was given the name of Hazleton because the community was in a hazelnut grove. Tenney served as postmaster. Three years later, C. Weistman also opened a general store and this little community quickly became the center of trade for the township. 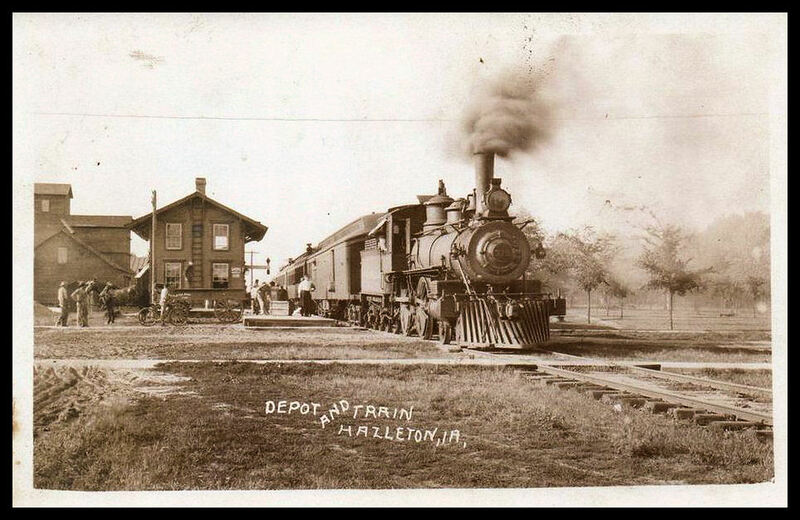 The coming of the Burlington, Cedar Rapids and Northern Railroad in 1873, however, spelled the doom of this town. The route of the road lay one mile west of the town. Accordingly, the stores, shops, and nearly all of the dwelling houses were moved to a position directly on the railroad. This site is now the present city of Hazleton. Several churches sprang up in the area. The Methodist Episcopal Society had their first organization about 1852. After meeting in various places, a building was erected in 1879. The Presbyterian church was organized in 1873 in the local community. They later put up a building and filed Articles on Incorporation in January, 1881. The Catholic church was first organized in 1881. They constructed a small church and parsonage. In the summer of 1892, the town was incorporated and the first meeting of the council was held on August 8, 1892. W.A. Nelson was the first mayor. 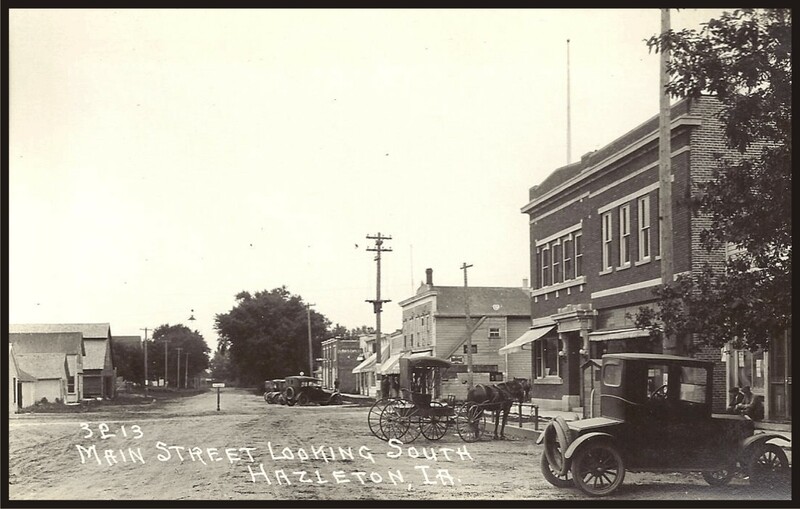 Hazleton had two banks, Iowa State and Hazleton State. Another distinct feature of the town of Hazleton was the fair, which was held each year, beginning in 1894. It steadily grew until it was thought to be better than the county fair in Independence. On May 3, 1899, at 1:45 AM, the entire business portion of the town was threatened with fire. All but four buildings were lost, a loss of $20,000.00 in one hour. The opera house, barbershop, one store, and a private residence was all that was left. This was a great loss to the people of Hazleton. Realizing the advantage of the railroad, the town soon began to pick up in commerce and trade and reached a high position in the county. The first newspaper was established in March 1900, called the Hazleton Pioneer. It lasted only one year. The next paper was the Hazleton Advance. After that discontinued, the Hazleton Free Press began. None of the papers lasted more than 4 years. In 1914, a brick and stone building to house the first high school in Hazleton was erected. The door opened in the fall of 1915 with 78 pupils. It was considered one of the most up-lo-date schools in the county. A gymnasium was later added. But in 1962, the vote was taken to consolidate and merge with the Oelwein Community School District. 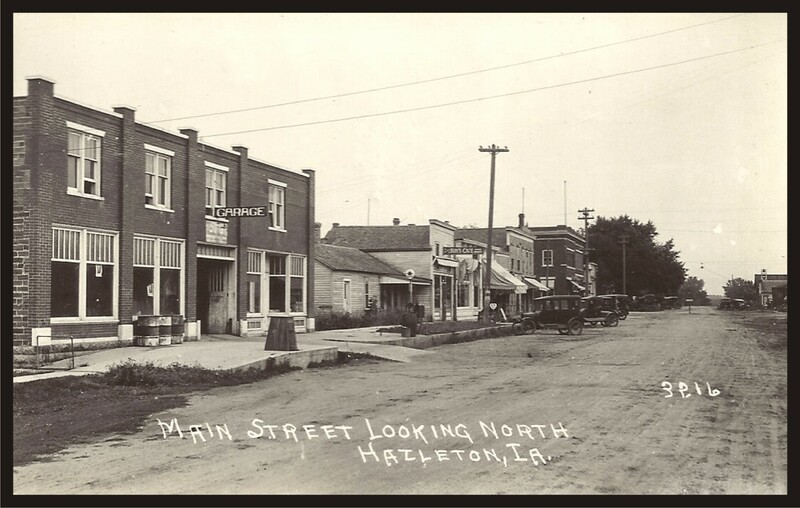 High school students went to Oelwein and the grade school stayed in Hazleton, but that, too, eventually closed. While the school and churches were growing the businesses of the town also expanded. 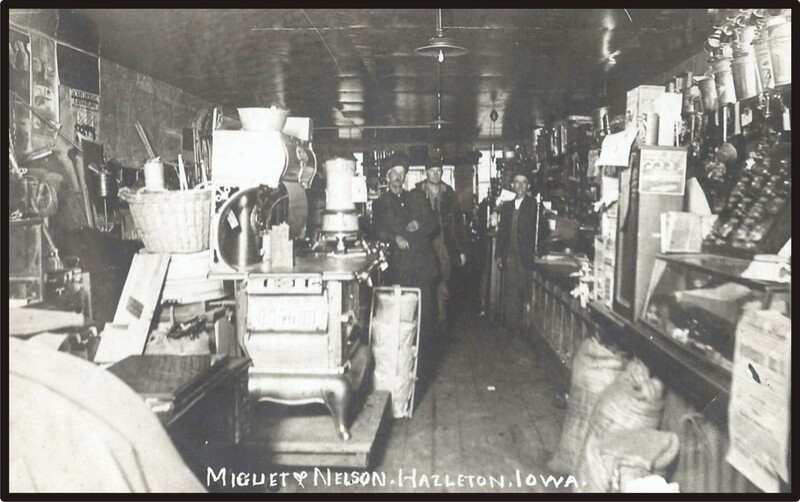 In the peak business prosperity, Hazleton had three grocery stores, a fine meat market, a drug store, a variety store, restaurant, department store, two barber shops, a lumber yard, hardware store, broom maker, and many other businesses. Besides all of these, the town had a huge ice house which furnished ice to the surrounding community. This ice was cut and hauled from Fontana Park Lake. Hundreds of car-loads of ice were loaded and shipped out by rail. 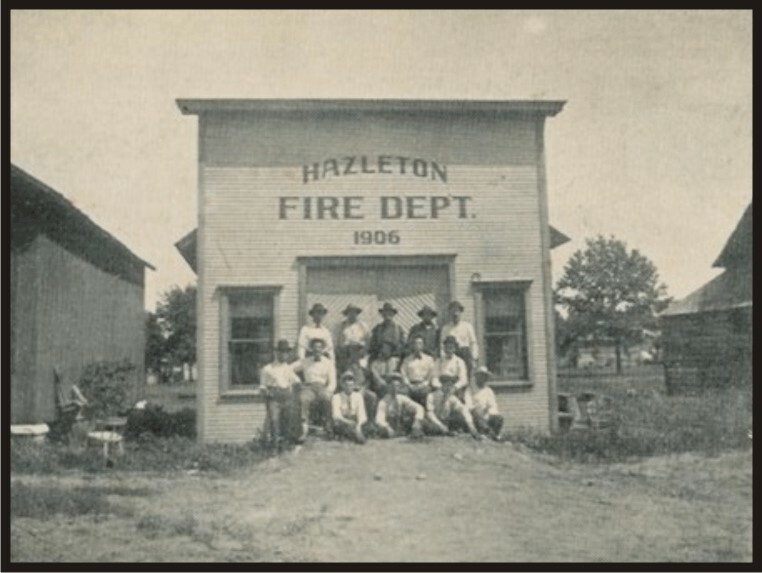 The Hazleton area has been associated with the Amish for many years. Buchanan County’s Amish colony started in the early 1900’s when 8 families left their mother colony of Kalona and started one of their own. They firmly believed that progress cultivated sin. They stick to the old ways in their transportation and clothing styles. The women fasten their dresses with common pins, and coil their long hair and top it with a white cap. Their clothes are plain colors. Men’s clothes, also homemade, are of denim and always fasten with hooks and eyes. However, their broad-brimmed, black felt hats are factory made. The Amish are good-hearted people, hard workers, good cooks, and find their joy in the simple things of life.